An Overwatch player’s attempt to save their team from an ultimate accidently resulted in several teammates’ deaths due to an unfortunate bug. Sharing evidence of their heroics gone wrong to the Overwatch subreddit, a player submitted a gif that showed a Roadhog trying to save his teammates from D.Va’s Self-Destruct, the ultimate ability that causes her mech to blow up and eliminate those around it. As those familiar with Roadhog and D.Va will know, the mech can be hooked after D.Va jumps out of it, thus pulling it towards Roadhog. This can either lead to a Roadhog foiling D.Va’s ultimate by moving it away from the team or the opposite effect that sees Roadhog placing his whole team within the mech’s blast radius. The latter happened in the gif below, but it wasn’t due to a bad hook from Roadhog. Grabbing the mech and slinging it right off the bridge on the Rialto map, the mech sank into the river just as expected. After disappearing under the water’s surface, it detonated, but its explosion was undeterred by the walkway above it. The blast expanded upwards through the ground, unblocked by the environment, and killed Roadhog along with at least four other team members. It’s an outcome that’s not at all expected given what should’ve logically happened when D.Va’s ultimate went underwater – the mech’s explosion shouldn’t have damaged the teammates due to the objects in the way. But as one commenter pointed out, the interaction seems to be a result of coding that sees much of Rialto using one-way collision. 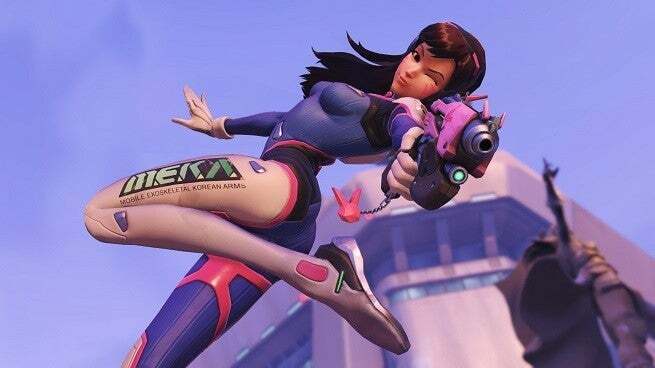 This means that while players wouldn’t be able to shoot through the ground and hit something underneath, D.Va’s mech can still damage everything above it once it goes under the map so long as the enemies are still within its blast radius. The bug was referred to as a game-breaking exploit, and while it certainly doesn’t actually break the game in any way, it is a frustrating one that doesn’t allow for much counterplay other than moving away from what’s now an unseen threat. Rialto isn’t the only Overwatch map with areas that players can get under as well, areas that exist right above the map’s boundaries, so the bug might not even be limited to Rialto. It does appear to be an unintended effect, however, so there’s a likely chance of it getting fixed if Blizzard takes notice and deems the change necessary.